She said something to the effect of, “I want the kids (and parents) who come here to think of it as one of their favorite places.” Obviously there’s more to her job of running a library/childrens’ department than this, but it’s stuck with me. And when I look around our department, I see this philosophy working its magic all over the place. It’s not uncommon (in fact it happens at least once a day) a child comes tearing, skipping, or dancing through the entrance cheering about something he or she can’t wait to do in the library. There is, however, a flip side to this excitement. It’s also not uncommon that a child throws a fit when it’s time to leave. It’s a good problem to have, but it’s a problem nonetheless. After all, if a child melts down at the end of a visit, it leaves him/her (not to mention the) the parent/caretaker with an unpleasant taste in the mouth. As a staff, we’ve been trying to come up with some quick and easy way to comfort kids who don’t want to leave. I am always amazed at how meaningful little tokens (e.g. stickers or bookmarks) are to kids. For example, we have clean-up stickers. We have tons of toys, puzzles, puppets in the play area. We try to keep an eye on it, but when we’re busy it can look like complete disaster area. Kids earn a big fancy sticker by straightening up a mess in the department. The clean up stickers work, and we see it as a model for putting the kibosh on “exit tantrums.” We’ve been racking our brains to come up with just the right thing. I had my first opportunity to test the wishing stars on a very distressed little boy. He had to return his toy trains to the desk. He was crying, stomping, and rolling around on the floor. His mother was looking pretty stressed. 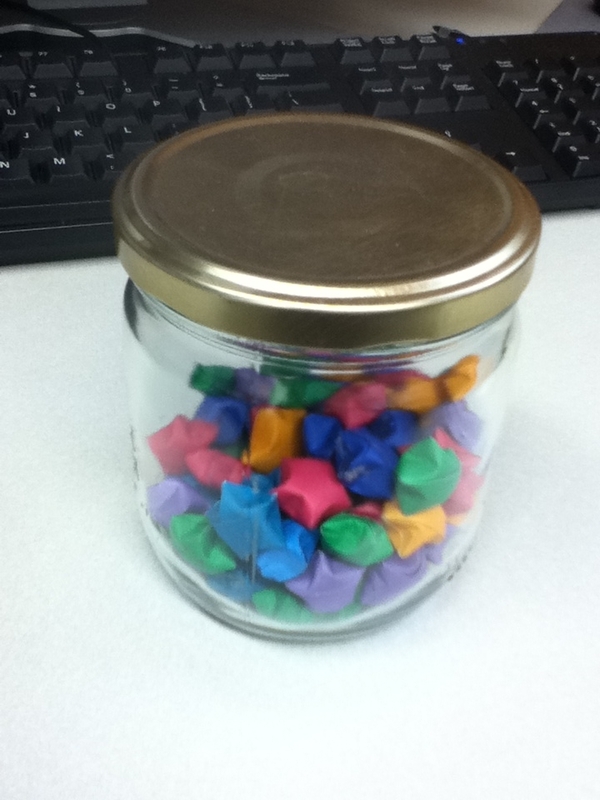 I approached them with the jar, and said, “Leaving can be so difficult, but perhaps a magic wishing star will make things a bit better.” His face lit up like a Christmas tree. Before his tears had time to roll off his chin, he picked out a blue star, and showed it to his mom in happy amazement. Success! It was such a simple thing, but they left happy. I am definitly going to order more of the paper strips to make them. Here’s a link to a video tutorial from Kwervner Design : http://www.youtube.com/watch?v=uD67Hw4kKw4 Easy peasy, right? We use coloring sheets as a tantrum stopper when our kids have to switch off of our literacy computers. Easy to change based on season; little to no cost. Perhaps not so dazzling, but that depends on how the child loves the subject of the page.